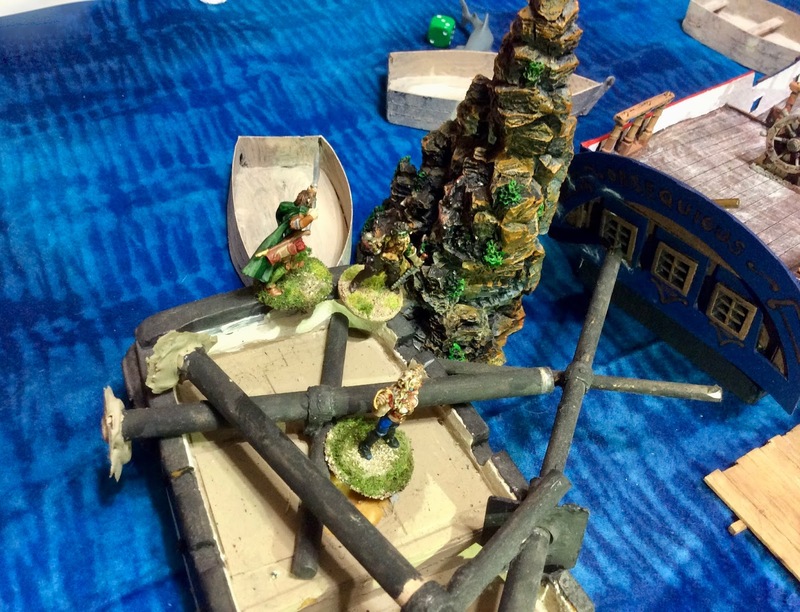 Ghost Archipelago Campaign ’18, Game 4: The Island of Floating Hulks | H.A.W.K.S. Chris Palmer This past weekend we got together for the fourth game in our Ghost Archipelago campaign. We had 6 of our regulars players, and we used an 8’x3’ table. For this outing, we decided to use a scenario from the November ‘17 issue of Wargames Illustrated, called “The Floating Hulk”. This was a scenario written by core-rules author, Joseph McCullough, and was designed for solo play. It featured a derelict ship floating on the ocean, that the player’s crew decide to investigate. It is guarded by Sharks in the water, and “Talonjacks” (think pterodactyls) in a large nest at the top of the mainmast. Also, the larger ship is difficult to climb up onto, so requires a Move roll with a target of 12. In order to make the scenario useable by our group, a few changes need to be made. Fellow campaign player Don Hogge, and myself, worked on reconfiguring the scenario so it would be playable by a group of 6 players, not just one. We decided to make it a large “island” of derelict ships, kind of like a ship graveyard, that had all gathered together amongst some jagged rocky outcroppings, forming one large intertwined mass. We then multiplied the mainmasts, with the central treasure and the nests of Talonjacks to a total of three; so there would be one for every two of our players. We then assigned a Shark to be just outside the starting zone of each player. 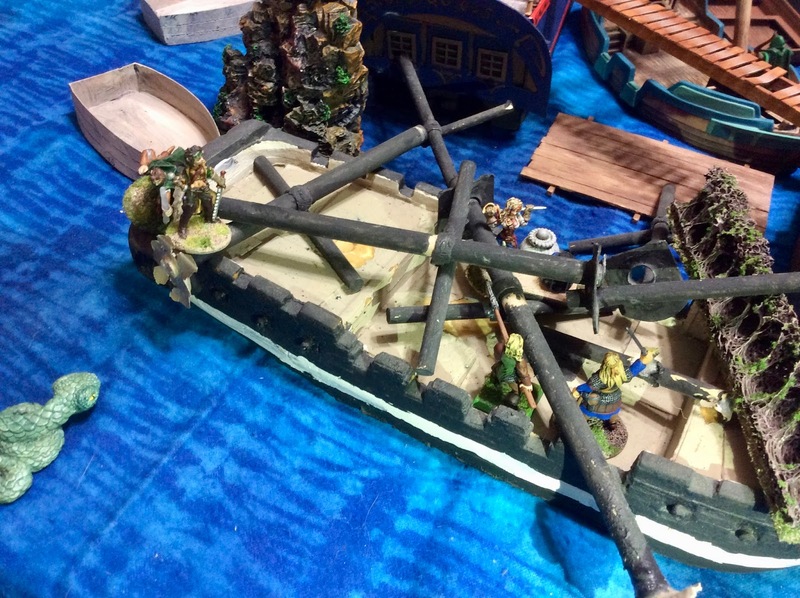 We also upped the number of total Sharks and Talonjacks that could be brought into play during the game, and created a specialized Random Encounter Table that contained only Aquatic creatures, and some creatures one might find on derelict ships; like Pirate Skeletons, Swamp Zombies, and Sea Rats. 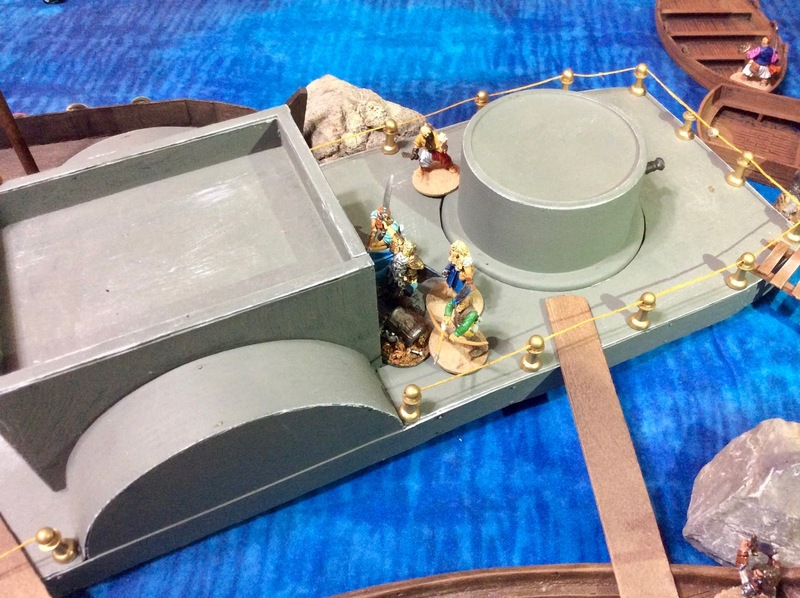 Also, a special rule of the scenario requires anyone trying to climb from one of the small boats onto one of the ships to make a special Move Roll with a target number of 12. 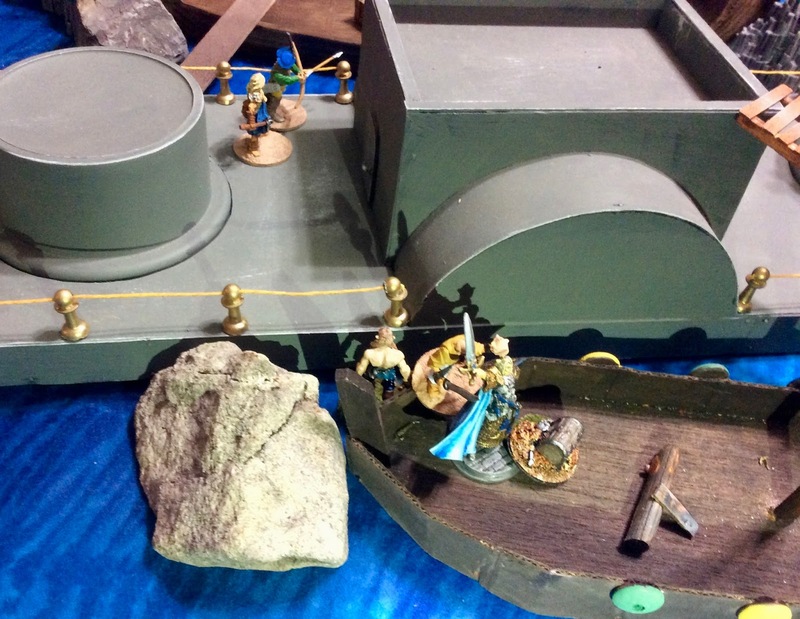 We decided to include climbing from the boats onto the rocks, climbing from a ship to a ship, or climbing from the sea onto one of the ships or rocks; figuring everything was a rocking, tossing, slippery deathtrap. 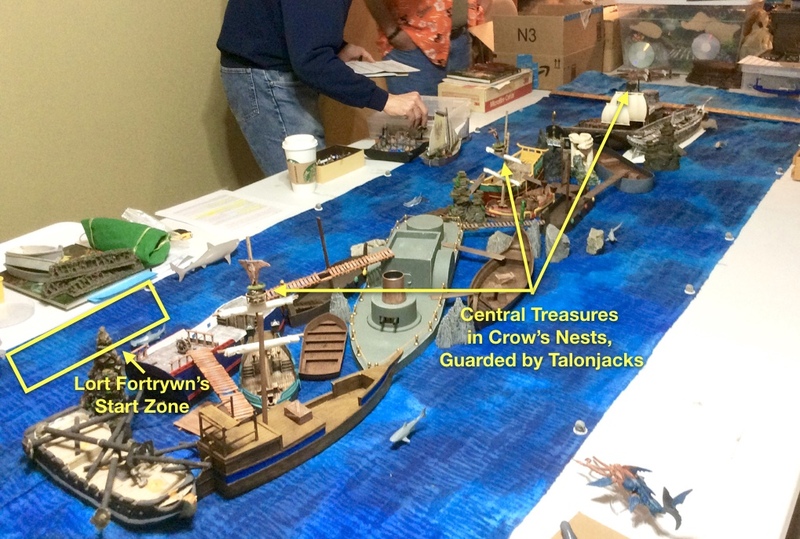 A long view of the table, showing my start position, and the locations of the central treasures. I was once again terribly unlucky in my choice of starting location, drawing chip #6, and being stuck with the spot no one wanted. Across from me was Skorri Drakenberg, and his new Beast Warden, Agger. (His Wave Warden, Anemone, having perished last game) To my left was the Heritor Molly Malone, and her Storm Warden, Niskaru. Diagonally to my my front left was Kragmar of the True Blood, and his Storm Warden, Samael Gale. 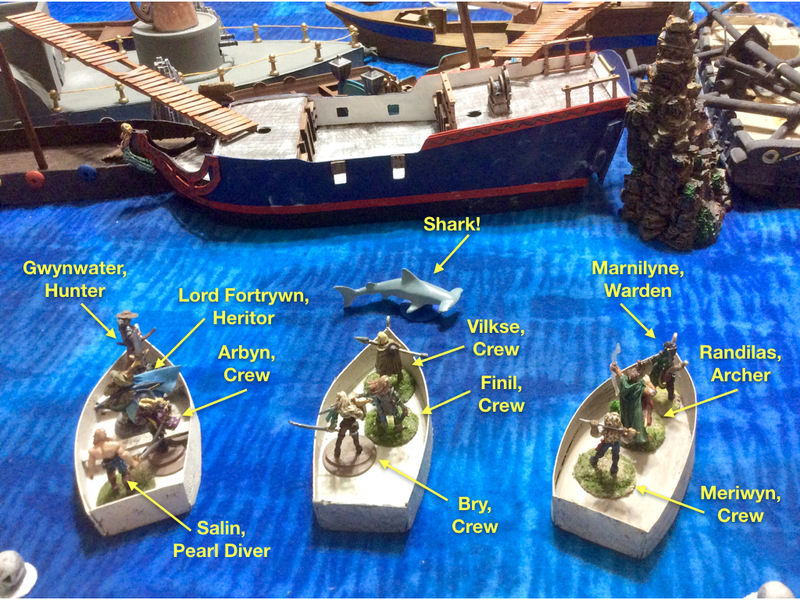 My crew’s deployment, and the location of the killer Shark. Lord Fotrywn collapsed the spyglass and handed it back to The Silver Sword’s captain. The Elf Heritor turned again to peer out across the waves at the black mass that lay along the blue horizon in the distance. It surely appeared to be an assortment of derelict ships, all trapped in an area of jagged rocky outcroppings jutting from the waves; their falling rigging and frayed sails causing them to become intertwined and locked together. The Elf Lord’s mind calculated the prizes that might await in the holds of those ships; already bought with someone else’s blood and effort in the deadly jungles of the Archipelago. Ready to be reclaimed by anyone who dare investigate the hulks. It was a risk he was willing to take. The Silver Sword’s Captain advised the Heritor that it would be too dangerous to bring the big ship in close to the rocks, they would need to use the small boats. Lord Frotrywn decided on three of the ship’s small landing boats so he would have more options where to land, and be able to cover more area. He divided up his party so that he would have his trusty Hunter, Gwynwater, with him; along with Salin, the Pearl Diver, and the able Crew-woman, Arbyn, who had proven her worth on more than one occasion. Lord Fortrywn assigned his niece and Warden, Marnilyne, to a second boat; along with Randilas the Archer, and the Crew-woman, Meriwyn. In the third craft were the three crew members; Vilkse, Finil, and Bry. As they approached the floating mass of seaweed-covered wood and rotting sails, they could make out large bird-like creatures flying lazy circles above the remaining tall masts of the hulks. Arbyn identified them as Talonjacks, a kind of pesky lizard-like shore-bird with a nasty bite, and sharp talons. They also saw the fins of several shark swimming lazily near the shipwrecks. Further out, they could discern the sails of other Heritors’ ships, and the small dots of their landing boats in the water. They weren’t alone. Lord Fortrywn steered his boat towards towards large vessel on the right of the “island” that looked promising. It had once been a fine ship and it’s bright blue and red paint could still be seen on it’s hull, though much of it was sun-bleached and peeling. They reached the side of the ship and found it was rocking up and down so and covered in slimy algae, which made climbing up aboard difficult, but they all managed it. Gwyn immediately turned and shot an arrow at a Shark, who was prowling the waters by the ship, but missed. 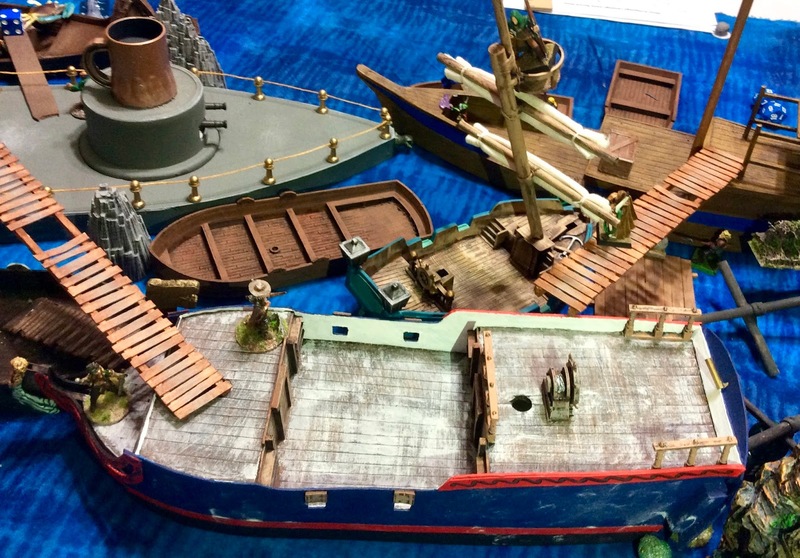 Arbyn spotted a promising chest under a nearby gangway and moved towards it, while Salin and Lord Fortrywn moved off to the left to investigate a large old Dwarven ironclad, whose hull was now about half rusted over and covered in barnacles. As the Heritor went, he could see the small boats of the other crews nearing the island of shipwrecks. He quietly cursed to the gods and pressed on. Lord Fortrywn, Salin, Arbyn, and Gwynwater, reach the blue-hulled ship. Marnilyne, with her boat, moved off to the right to check an old black-hulled ship, whose masts and rigging lay in a tangled heap upon it’s deck. She thought she saw movement, and the bobbing head of another crew approaching the black ship from the far side, so took the precaution of casting Brambles on the front of the black ship’s deck. While she worked her magic, Randilas the Archer , also in her boat, turned and fired at the Shark, missing like Gwyn the Hunter had. The third boat, with the three ship’s crew aboard, moved to intercept and deal with the Shark. Bry and Vilkse had their weapons at the ready as Finil guided the boat at the beast. The two crew slashed and stabbed at the Shark but missed. The creature however leapt suddenly at it’s attackers and it’s mighty jaws clamped down on Bry’s sword arm. She cried out in pain and shock as the Shark suddenly twisted and yanked her clear off the boat. Vilkse leaned forward to help, but instead caught the full brunt of the beast’s tail as the Shark completed it’s twisting turn, pulling Bry under the water. The force of the tail dislocated the crewman’s jaw, and unbalanced him. With a grunt his feet went out from under him and he fell forward, his knees cracking on the side of the boat, and he tipped forward into the murky blue water. Finil now found himself alone on the little boat. Desperately he scanned the choppy waters for some sight of his companions or the Shark itself; but he saw nothing. As he leaned forward searching, the creature came from directly below the boat and rammed it with his head from underneath. The lone Crewman pitched forward out of the boat. As he hit the water, he felt the Shark’s jaws clamp around one of his boots, and with a yank he was pulled beneath the surface. Gwyn, watching from the nearby ship, could not believe how quickly the three had disappeared. Far above the choppy surface of the water, grey clouds began to boil up in the sky, as the Warden, Niskaru, cast Cloud Cover above the shipwreck island. Vilkse, Bry, and Finil begin their fateful first turn fight with their hungry friend. 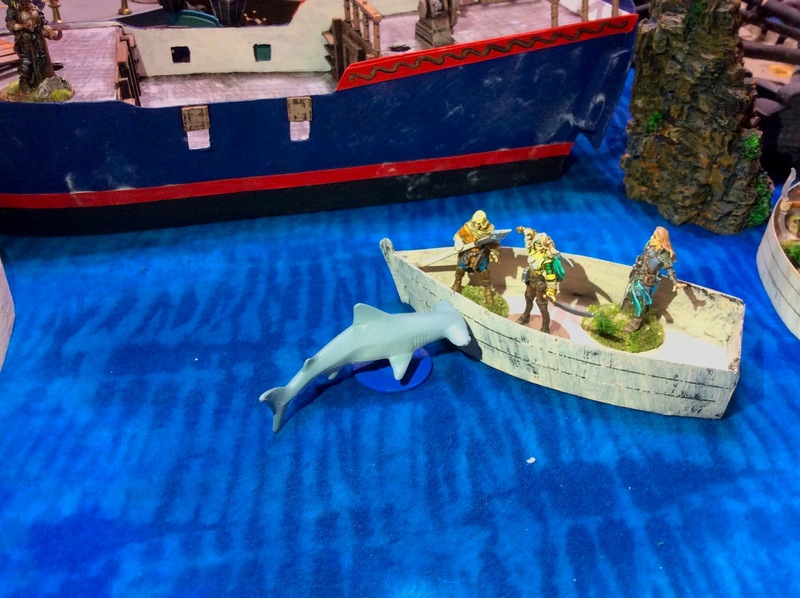 Next to the Warden, Randilas, the Archer, fired another arrow at the Shark. He hit the beast, but the missile merely sliced through the creature’s fin (-1 HP). Meanwhile, the third member of their group, Meriwyn, spied a promising chest near the middle of the deck and clambered across the rigging-strewn planks towards it. On he blue-hulled ship, Gwyn had painfully gotten back to her feet. Beyond the sharp stab of the shaft in her back, she could feel an exquisite spike of heat when ever she inhaled deeply. She knew her lung was punctured. Gritting her teeth, knowing she had a job to do while she still had breath, the Hunter drew back her bow as fire burned across her back, and she launched another arrow at the Shark, missing. Below the injured Elf, on the prow of the ship, Arbyn had secured the chest she found there, and dragging it over to the edge, let it drop into their boat below. Marny, Randlas, and Meriwyn reach the black-hulled ship. Meanwhile, Lord Fortrywn had raced along the gangway over to the rusty old Dwarven ironclad, and quickly climbed down the engine house. Seeing some of the Heritor Molly Malone’s crew rounding the front turret of the vessel, he Surged froward to pick up a chest that lay just behind the metal structure. Salin, the Pearl Diver, followed on a lower path, crossing over an old Barbarian ship, with it’s tall dragon masthead and a few old shields still adorning it’s sides. 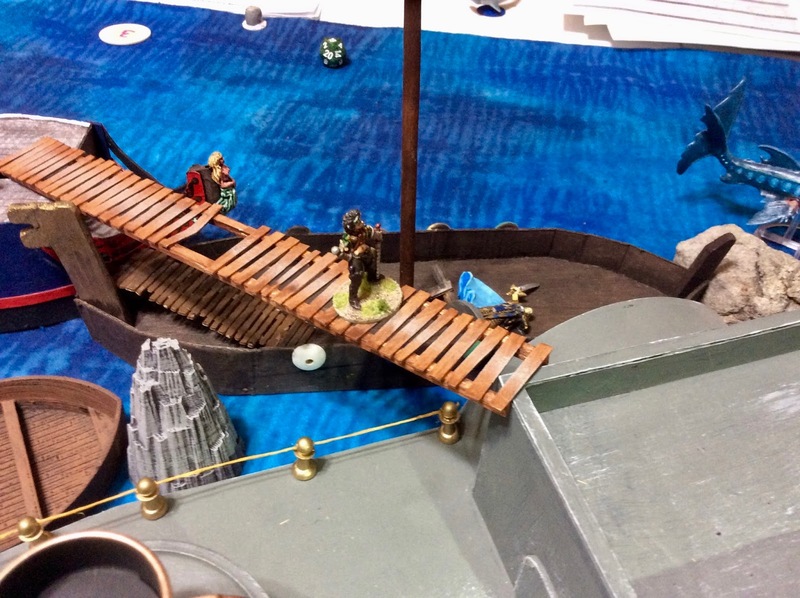 He jumped for the deck of the Dwarven ship, but miscalculated the roll of the two ships, and ended up short; one foot getting a brief hold on the edge of the smooth metal deck of the Ironclad before he slipped backwards and tumbled into the sea in a small area between the Barbarian ship, the Ironclad, and a large slime covered rock. The zing of a crossbow bolt from one of Molly’s crew, shot over the Pearl Diver’s head and imbedded itself in the Barbarian ship behind him. Meriwyn reached the chest on the deck and picked it up. Behind her Randy fired an arrow at a pesky Needlefish that appeared, leaping high out of the waves off the Starboard side of the ship, killing it instantly. Over on the blue-hulled ship, Gwyn fought through the pain and fired at the Shark again, missing it once more. She cursed, at her own weakness. Arbyn looked at her concerned, and asked, “Can I help you?" The Hunter merely shook her head, and through gritted teeth said, "Get on the boat, and get that chest safely out of here. I’ll be fine." By the gods, it hurt just to talk. Her breath gurgled with moisutre. Gwyn knew her lung was beginning to fill with blood. 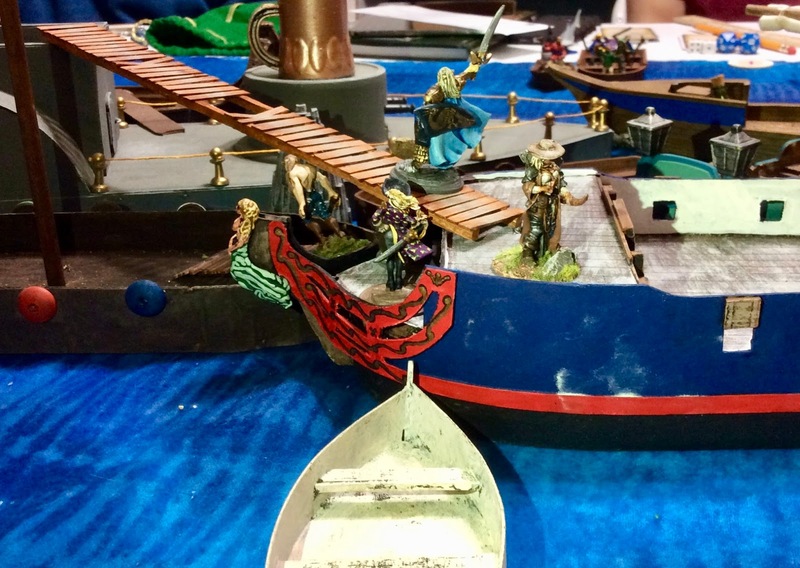 Lord Fortrywn reaches the treasure on the Dwarven Ironclad, but is quickly swarmed by the Heritor, Molly Malone, and her crew. Gwyn’s health continued to decline, but she didn’t give up; focusing all her energy she aimed at the Shark, and this time hit it squarely. (Shark reduced to 2 HP). Randilas, over on the black-hulled ship, followed up her shot with another true hit, finally killing the beast. Lord Fortrywn tries to make his escape, but is caught by one of Molly’s crew; as Salin flounders in the small patch of sea, literally caught between a rock and two hard places. After Randy finished off the Shark, he turned back and caught sight of a Large Snake gliding through the waves towards the ship. (Summoned by Skorri’s Warden.) Between the appearance of this new threat, and knowing Skorri and the enemy Pearl Diver were almost upon them, he moved back and up onto a large rocky outcropping at the back of the black-hulled ship. Marny cast Brambles once again along the centerline of the ship in a desperate attempt to slow Skorri and his Pearl Diver, and then she herself fled too, back onto the ships’ fallen mainmast, by way of the top yard. The pair of enemies had now climbed up the side of the black-hulled ship, and were just crossing over the railing as the Warden’s thorny vines grew to their full height. Meriwyn moved away as fast as she could, picking her way through the fallen masts and rigging, carrying the heavy chest. Frantically looking around, she decided her best route was to chance crossing the fallen mainmast, like Marny had, over to the blue-hulled ship. As the Crew-woman stepped out on the yard with her heavy load, she felt a sharp stab of pain in her side as an arrow hit her from one of Skorri’s Archer’s, almost knocking her into the water. The Elf sailor gritted her teeth and with her free hand she yanked on the shaft, located just a few inches below her ribcage. Crying out in pain, she removed the projectile, but was suddenly overcome with dizziness, and her whole side began to heat up into extraordinary pain. The skin all around the wound was turning bright red. (The arrow had Envenom cast upon it.) Realizing she had been poisoned, Meri prayed she would make it across the mast. 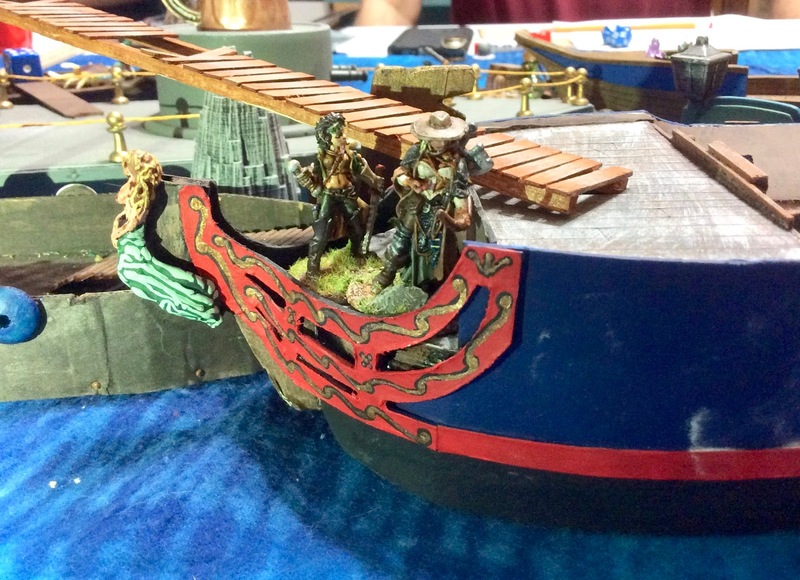 As Meriwyn tries to escape with the treasure, the Heritor Skorri Drakenburg, with his Pearl Diver, reach the deck, while Marnilyn the Warden prepares to cast another Bramble down the centerline of the vessel. Arbyn had obeyed Gwyn’s command, and dropping down into the boat, untied it, and shoved off. As she turned and picked up one of the oars, she noticed a sight that filled her with dread; less than 50 yards away, the Crew-woman saw the tell-tail tentacles and large fin of an Octopike. Gwyn saw the beast too, and straining, fired an arrow. Her shot went far wide as her ability to hold her arm steady was diminishing. Frantically, the Crew-woman began to paddle, but the creature had seen the small craft and sped towards it. Arbyn set the oar down and, standing, brandished her sword. She had been sailing most of her life, and was not afraid to face any monster of the sea with a good Elven blade in her hand. She smiled, and braced her feet in the rocking craft. The Octopike disappeared a few yards from the boat; then with a shower of spray 8 powerful tentacles burst from the waves right next to the tiny vessel, and shot forward to wrap themselves around it’s next meal. But Arbyn, daughter of the sea, was not prepared to die that day; and before the tentacles could tighten their death grip around her, the Elven sailor pulled back her arm, and leaning forward plunged the long blade down the very gullet of the beast, her hand nearly being sliced on the rows of sharp teeth in its yawing mouth. (Rolled 20 + 2F!) The Octopike writhed, and released it’s tentacles as it pulled back, an off the blade; disappearing again beneath the waves. Arbyn stood still for a moment scanning the surface of the water, then turning she set the sword down beside her and picked up the oar once again. Arbyn prepares to make her escape, as the Octopike approaches. Back on the fallen mast of the black-hulled ship, Marny knew instinctively that something had happened to her Uncle. As Skorri and his Pearl Diver easily climbed her Bramble obstacle in the center of the ship, the young Warden tried to ignore the feeling she was having about her Uncle, and once more attempt to cast Brambles in the path of their pursuers; but her mind was too clouded and the spell failed. She called to Meriwyn, "Hurry!”, then turned and climbed up the stern of the blue-hulled ship. But it was no use; in a blink Skorri was upon the Crew-woman and sliced her callously with his sword while nimbly grabbing the treasure from her. She toppled from the mast, her body falling to the waves below. Over on the rock, Randilas the Archer fired at the Large Snake, but missed. He then turned and attempted to follow Marny by jumping from the rock to the back of the blue-hulled ship, but he miss-judged, and dropped into the sea below. The chase across the fallen mainmast, as Drackenburg reaches the wounded Meriwyn. Back on the Barbarian ship, Molly Malone laughed at the sight of Lord Fortrywn sprawled on the deck. “Arrogant Elf,” she spat. “He got what he deserved." Turning, she made to jump back onto the Ironclad, but misjudged the pitch of the two ships, and splashed into the water next to Salin; who still was trying to free himself from his watery prison. (Failed Move Roll again!) She swung her sword wildly, and it hit Salin in the shoulder. It was not a direct hit, but there was enough power in her Crushing Blow, to give him a deep cut. (-4 HP). From the back of the blue-hulled ship, Marny immediately saw Gwyn and noticed the arrow sticking from her back. There was small pool of blood on the deck by her left boot, and the Warden could see the Hunter’s face was almost pure white. Running towards the tall Elf she began chanted the spell for Waters of Life. Running and casting was a mistake though, as quickly she lost the cadence and began to lose the spell. The young Elf, stopped and concentrated; the Warden could feel the spell continue to slip and focused her brain with all her might. A fire began to burn behind her eyes, and her knees gave out. Marny fell to deck hard. (Pushed spell for -5 HP) But slowly, the waters rose up the side of the ship, and began to pool around the Hunter, washing away the pool of blood and climbing up her boot. Gwyn could feel a slight relief from the pain. It would have to be enough. Out at sea, Arbyn was paddling to get away as best she could. 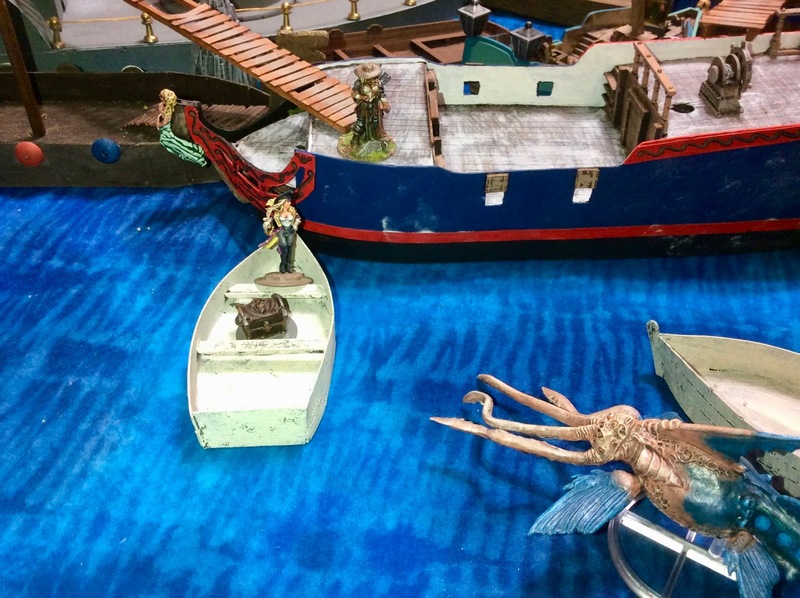 Suddenly, the there was a thud against the side of her boat, and the tentacles appeared again! She hadn’t killed it after all. From the deck of the ship Gwyn hastily fired at the beast but missed. On the little boat, there was no time for Arbyn to reach her sword, so as the tentacles probed the boat ,she reached out her booted foot and stamped on the nearest. (I win but do 0 damage.) It was enough. Once again the beast withdrew for good. Over by the Barbarian ship, Molly Malone soon realized what a dangerous place the small space between the ships was, and leaving the Pearl Diver to be ground to pulp on his own, used her blood gift strength to pull herself up and on to the ironclad. Miraculously, Salin, too, was able to finally get the leverage he needed and hoisted himself up and onto the rock. (Finally made my Move Roll!) At last he was free! Gwynwater, on the far side of the blue-hulled ship’s deck, fires her final arrow at the enemy Archer in the crow’s nest. Back at the black-hulled ship, the Heritor Skorri Drakenburd and his Pearl Diver jumped down from the fallen mast onto a seaweed covered raft a short distance away. Upon landing, the Heritor turned to see if anyone was following. Noticing Randilas in the water below the rock, he fired his bow, striking the Archer in the chest below his right shoulder. (Reduced to 1 HP left.) Randy fell backwards, trying to stay conscious. Desperately, he began to climb back up the rock, but saw the Large Snake come around it and move towards him. As best he could the Archer gingerly un-shouldered his bow and fired an arrow at the Snake, hitting the creature near the tail. (-4 HP). Then, using his good left arm, he hoisted himself up onto the rock. Marny reached Gwyn and asked how she was doing. "Better Now. Thank you” the Hunter replied, thought the Warden could see the pain and weakness in the Elf woman’s eyes. “Are you sure you’ll be alright?” the young elf asked. Gwynwater nodded. “I need to go find my Uncle, and see if there’s anymore treasure to be found," Marny explained. And with that the Warden turned and ran off in the direction Lord Fortrywn had gone. The Hunter watched the girl go, and took a deep gurgling breath. A shout behind her caught her attention, and turning she crossed the deck. Looking up, she saw one of Skorri’s Archers up in the crows nest of a small derelict sloop right behind the blue-hulled ship. He seemed to have found something, and was calling to his friends on the larger vessel behind. Slowly, the Hunter raised her bow and notched an arrow. Determinedly, she drew back the bow, despite the fiendish pain it caused her. Gwynwater could feel a trickle of blood going down her back, but she did not waiver. A brightness shown in her eye for a brief flicker as she sighted down the shaft at her target. "Let it fly true.” she whispered to herself, and released the arrow. her trained eye followed the shaft all the way, and a slight smile formed t the corners of her mouth as she saw the shaft hit home. The man tumbled backwards out of the crows nest to the deck below. (I rolled a 20!) “Perfect.” she said softly to herself, and she closed her eyes for second. “Are you sure you’ll be alright?” the young Elf asked. Gwynwater nodded. Across the way, Skorri Drakenburg, form his position on the raft, saw his Archer fall from the crows nest. Turning, the Heritor looked for where the shot came from. He could just see the top half of Gwyn over the rail of the ship, her tall frame silhouetted against the bright blue sky. Drakenburg quickly readied his bow, and drew the arrow back with all the strength of his blood gift. Up on the blue-hulled ship, Gwyn began to look for another target when her delicate Elven ears heard the distinctive twang of a bowstring over the sound of the waves and the creaking and groaning of the ships. Instinctively, she turned her head in that direction, and caught site of the shaft in the second before it hit. Being a trained Archer with decades of experience, she knew; and gently she closed her eyes. The Heritor’s black shaft struck true high on her chest with enough force it threw her back as it pierced her breast bone. For a second Gwynwater Lighteye had the sensation she was floating before landing hard on the deck. She thought of the Warriors Hall on the Golden Shore. There would be a seat for her she knew. Puzzled, she thought she heard the crystal sound of a silver horn sounding in the distance, as the darkness grew around her and all became quiet. As Salin stood on the rock by the Barbarian ship, he noticed a lone Crewman, one of Molly Malone’s, sitting in a small boat guarding a treasure. It seemed ideal, and the Pearl Diver dove in the sea and swam towards the unsuspecting man. With his strong swimmer’s muscles he covered the distance in no time. Like a shot he sprung from the water and began to climb aboard the little boat, much to the man’s astonishment. 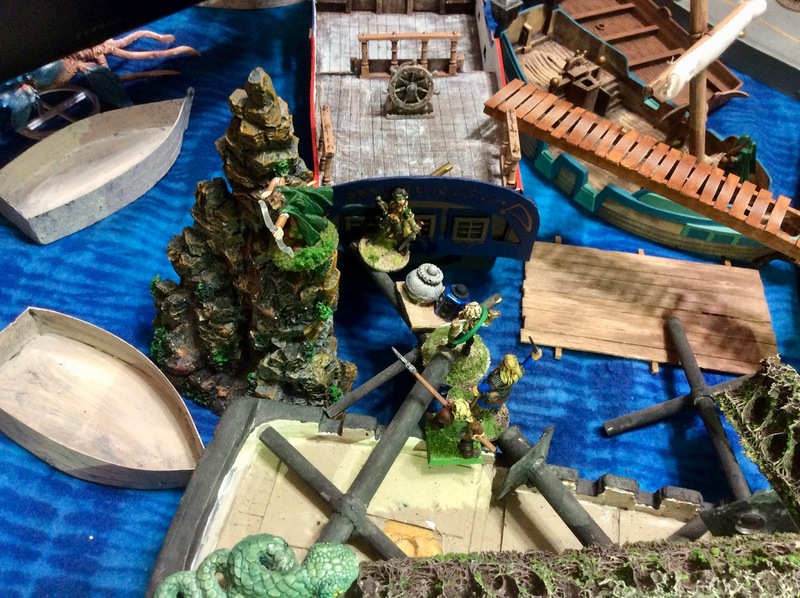 But the Pearl Diver did not notice one of Molly’s archers on a dilapidated barge at the front of the ironclad. The man drew his bow with skill and fired at the newly appeared threat to his group’s treasure, hitting Salin’s sword arm, almost pinning it to his side. The Pearl Diver fell back, blacked out, and sank beneath the waves. Over on the rock by the black-hulled ship, Randilas weakly climbed higher to escape the Snake, but it was no use. It eventually caught up to him, and try as he did to defend himself, the Snake was able to get ahold of his leg; and as it clamped down, with a snap of his head, the creature yanked the Archer from the rocks, and he fell into the sea below, passing out as he fell. Marny crosses over the gangway to the Ironclad, spotting her Uncle along the way. Lord Fortrywn awoke with a start, and found himself in his bed on the Silver Sword. The first thing he noticed was the noise, and the bright light streaming in through his cabin window. It was loud…his mind was foggy but he tried to put the pieces together. The indiscernible shouting, chains jangling, somewhere a horse whinnied…then the smells hit him; fish, tar, spices…it was a port. He quickly looked around, and he saw his Niece sitting by his bed, and at the foot stood the ship’s healer. The old Elf looked at him with concern, “How do you feel, my Lord?" Lord Fortrywn’s thoughts turned to himself. He seemed to be in one piece. What had happened? He shifted in the bed, and that’s when the pain hit him; a hot spike in his chest. "Try not to move too much, my Lord”, the healer added. “It was a very bad wound." Marny’s face went from reddened to white, and she swallowed deeply and then fought back tears, “She’s…she’s dead, Uncle." And a tear began to run down her face. Lord Fortrywn closed his eyes, and the room felt like it was spinning. Gwynwater gone? He couldn’t believe it. But somehow he could feel it was true. She had passed on to the Golden Shore. He wished he had been there for her in the end. The healer exited the cabin as the girl stood awkwardly, “Yes, Uncle." And she reached over and grabbed a delicately carved crutch from where it leaned against the wall. It was covered in small green leaves and white flowers, and Lord Fortrywn realized it was a living plant as well as a crutch. Tucking the crutch under her arm, the girl turned to leave, and the Heritor noticed then the bandage around her foot and lower leg. "You’re foot, girl?” he snapped. And Marnilne stopped at the cabin door, and turned. Looking down at the foot, not meeting her Uncle’s gaze, she said simply, “I lost two toes, Uncle. Fighting for a treasure." Sadness welled up inside again. Her uncle had no reply, as he absorbed this information. She shrugged resignedly to herself, and backing out of the cabin door, closed it softly behind her. The final post-game roll call. I feel like I say this every week, but: Wow, what a game! And a long game, too! Losing three of my party in the first turn was a big letdown to start off with. And then the carnage continued for 8 more turns! (The game was a total of 9 turns!) 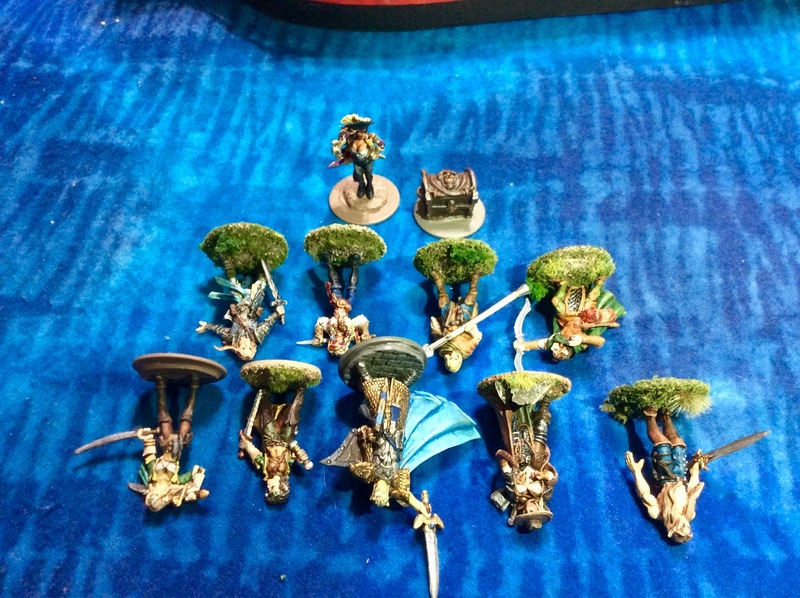 One by one my crew fell, with only Arbyn with her treasure being able to escape unscathed. And the bad luck continued in the after-game stage too, with me rolling Badly Wounded for Lord Fortrywn, and then Permanent Injury for Marnilyne; with her result roll for that being "lost toes”?! Not even something heroic or dramatic. Hoping the bad luck was behind me, I started rolling for crew, and then first off rolled a 2 for Gwynwater the Hunter. Dead. 😦 I was so sorry to see her go; she was a favorite. I really liked the figure I used for her, and she was fun to write. The rest of the rolls were better, with everyone being okay; except for Bry, who ended up being Wounded in her fight with the Shark. I ended up with only one treasure, but that was Magic Light Armor +1 F, which is pretty nice. But no gold though. With my Hunter dead, and the loss of an Archer a couple games ago, I decided it was time to head back to port; as my firepower was now too under-strength to be competitive. I sold the Magic 2-Handed Sword (350 GC), and the Superior Dagger (80 GC) I found in the last game to fund the trip back to the mainland (-200 GC), and pay for a new Hunter (-100 GC), new Archer (-50 GC), and the Healing Potion (-75 GC) to let me use my Heritor at full strength next time. Ah, well; easy come, easy go. The scenario was treacherous. Luckily I did do better than many of the others with the climbing from ship to ship; with Salin the Pearl Diver being the lone extreme exception; ending up stuck in the water for 3 turns! Unfortunately, where he fell in the sea was closed off on all sides and allowed no way for him to swim away. Also, thankfully, the Talonjacks all but ignored me. When they appeared, Skorri did a good job of either shooting them out of the sky, or using his Beast Warden to control them. Others weren’t so lucky. Final analysis, I shouldn’t have gone fool-heartedly chasing after treasures with lone figures. I need to be more conservative, and stop risking my key crew on wild chases. I think I also need to stick together better. It won’t allow me to cover as much ground, but it will allow me to have the strength I need wherever I do go. What a great looking game and compelling report! You guys continue to inspire me!